All eyes are on Italy’s 2019 budget, which will be viewed as a gauge of the country’s needed commitment to fiscal responsibility. Our base case: The budget – to be announced this week and submitted to the European Commission by mid-October – is likely to be moderate enough to win EU approval. This should create some room for assets from Europe’s periphery to rebound further. Yet structural issues bubble below the surface. A further deterioration in already weak Italian fundamentals – notably a debt-to-GDP burden above 130% and growth potential below 1% – would leave Italy vulnerable to a growth slowdown or external shock, though we see neither as imminent. Download the complete weekly commentary here to review BlackRock's chart of the week and compare Italian and European equity and government bond performance from 2017 - 2018.
dashboard shows. This means negative surprises could incite a sharp market reaction. At the same time, a truce in trade tensions between the U.S. and the EU has helped relieve some pressure on European companies, especially automakers. Bottom line: We see a low likelihood of a flashpoint between Italy and the EU in coming months, but we remain cautious on longer-term political and economic dynamics. European earnings growth lags other regions, and we prefer U.S. stocks as a result, as well as emerging market (EM) equities. Within European equities, our preferences include the industrials and health care sectors. We see reduced near-term risk of flare-ups over eurozone cohesion, but still see non-eurozone assets offering better risk-adjusted returns. Global equities rose last week even as the U.S.-China trade conflict escalated. Value stocks rallied. The U.S. Treasury yield curve steepened. The Fed is likely to raise rates this week and again in December, but its path in 2019 is less clear. Friday’s inflation data could provide clues. We see the Fed raising rates another quarter percentage point at its meeting this week and then likely again in December, against a backdrop of solid jobs growth and inflation. The rate path appears less clear in 2019 given the uncertain economic impact of trade conflicts, but we see potential for two to three rate hikes. The Fed’s “dot-plot” rate projections, which will extend to 2021 this week, may provide some clues, in addition to the Fed’s preferred measure of inflation, core PCE, to be released Friday. 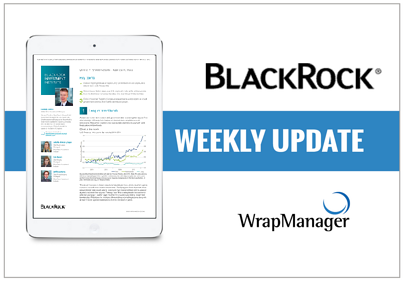 Download BlackRock's commentary now for an overview of specific economic events to watch in the week ahead and more. To learn more about BlackRock, their performance, or how to invest your core portfolio, request more information on this manager now.